I never thought it would be me watching First Lady Michelle Obama walk into the East Room of the White House. Well, at least I didn’t think it was going to be while I was still enrolled in school in Oregon. You’re probably wondering why 12 Oregon State University students, including myself, took off to Washington, D.C. during midterms. Well the answer is … complicated. Earlier this year, Oregon State was named one of the very first Grammy Museum affiliate universities. The Grammy Museum is indeed a relative of the Grammy Awards that air every February. It is not only a physical musical museum down in Los Angeles, but an extensive educational program “devoted to exploring and celebrating music,” according to their website. This also means that as a student of a Grammy Museum affiliate, if you ever find yourself in Los Angeles, you can schedule an exclusive tour of the museum. This is definitely something I’ll take advantage of after my experience in Washington, D.C. The executive director of the Grammy Museum, Bob Santelli, has a special interest in Oregon State because of his daughter Jenna Santelli, a 2008 graduate and a former swimmer on the OSU women’s team. There are currently three other universities across the country that are Grammy Museum affiliates: University of Southern California, Monmouth University and Delta State University. Out of these schools, we were selected to be the special guests of the Grammy Museum at this year’s White House Music Series, “Stars and Stripes Forever: A History of Music and the Military,” hosted by Obama. 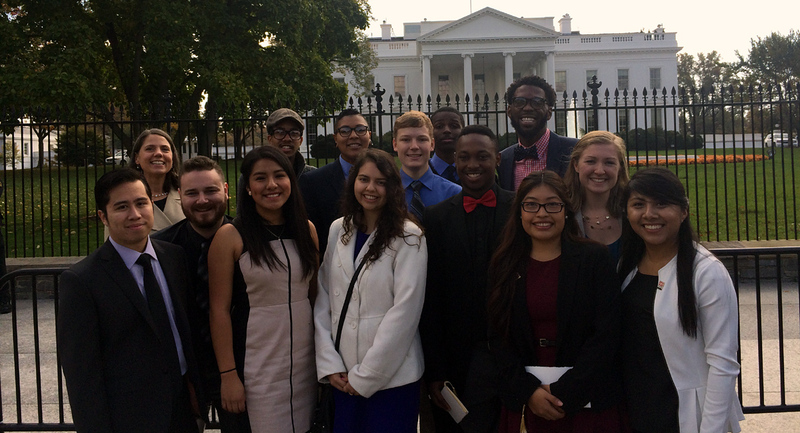 A group of twelve of us from many different majors at OSU were then selected to go on this once-in-a-lifetime trip to our nation’s capitol. Other than the regular sightseeing, we got to participate in various workshop activities around the city. First, we met up with Santelli as well as some very big names in the music production world at the Hotel Washington directly across from the White House. On the panel were Ken Ulrich and Ron Facelli, producers of the Grammy Awards, and David Thompson, the producer of “In Performance: at the White House,” the performance series that paired this workshop with the Grammy Museum. I was a bit awe-struck at some of the names that these people have stories about. They were casually dropping names like Justin Timberlake, Mumford and Sons and Aretha Franklin. Thompson, who has worked with several different presidential administrations on the music programs, commented on the difficulty of working with different presidents’ tastes and interests in music. He said that Reagan loved putting on concerts for all of his Hollywood friends, while George W. Bush did not care so much for music. They all agreed, however, that the current administration has been very fond of incorporating music of all sorts of genres, especially in educational programs like this one. The morning of our White House visit, the group of us made our way to the east entrance dressed to the nines. As I waited in line to go through the multiple levels of security checks to get into the building, I thought about what my parents told me: “remember your manners; someday, you might have dinner with the President.” Well this was close enough. In the foyer of the east wing, a three-person military jazz combo played as we all gawked at the iconic paintings and priceless furniture displayed as just a natural part of the atmosphere. After we and some high school students were all funneled into the east room, I anxiously waited for the hostess and the distinguished panelists, Willie Nelson, Common, Ted Peterson and Sergeant Christiana Ball to arrive. As the first lady addressed the crowd, she was both humorous and poignant about the subject of military families; most of the high school students were from military families, and almost 2 million young people nationwide belong to such families. “As tough as it is (for children from military families), this stuff really makes you stronger and more resilient, and that is what will make you successful,” Obama said. The first lady also remarked that it is these military children who are her and the president’s true heroes. After her opening speech, the floor was opened to the other very recognizable guests, moderated by Santelli, and they talked about how they got started in music and how it inspires them through the hardships that life throws. “You learn about yourself when you express yourself … Speak your truth no matter what,” said Grammy-winning rapper Common. Willie Nelson ended the workshop with a short piece of his on a guitar that looked like it had been with him since the beginning. “I know the power of music; I see it every day,” Nelson said. As we all headed out of the White House, I felt overwhelmed by the experience I had just had. I hope that it was not my last time in the White House, but it was certainly an amazing first time. Five Political Science students represented OSU at the 2015 Model EU competition in Seattle, accompanied by professors Alison Johnston and Sarah Henderson.